If any device starts to behave oddly or slowly, there's a decent chance that wiping the system cache partition can help. The system cache partition is a storage area for system data such as logfiles, frequently accessed app data that has been temporarily cached there, and downloaded apk installer files from Google Play. Over time, this temporary data can build up and potentially contribute to system slowdowns or even misbehavior. Clearing this cache partition can potentially help, and should never be harmful, because no personal data will be lost. In order to wipe the cache partition, you need to access the device's Recovery Menu. 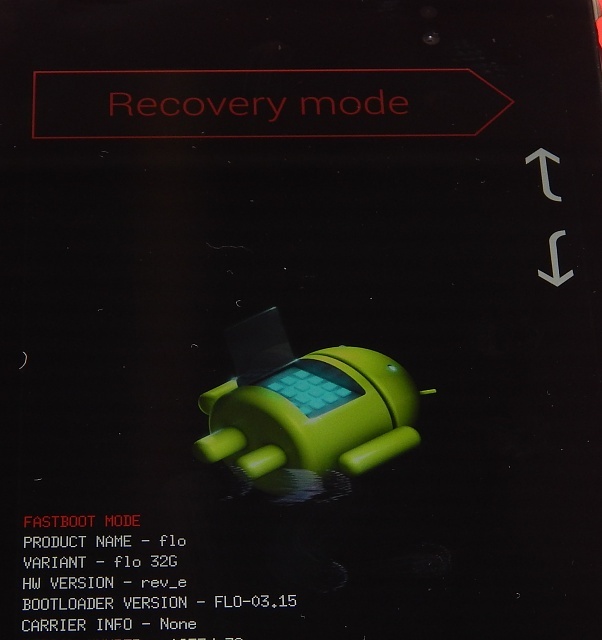 Many devices allow you to access the stock Recovery Menu by executing a certain pattern of button presses, but certain devices lock you out of the Recovery Menu. You can get around this by installing a custom recovery, but that's beyond the scope of my experience. Trying to find out how to access the Recovery Menu for a given device can sometimes be frustrating, even with a Google search. You may need to use search terms like recovery, cache partition, or reset, along with the name of your device. 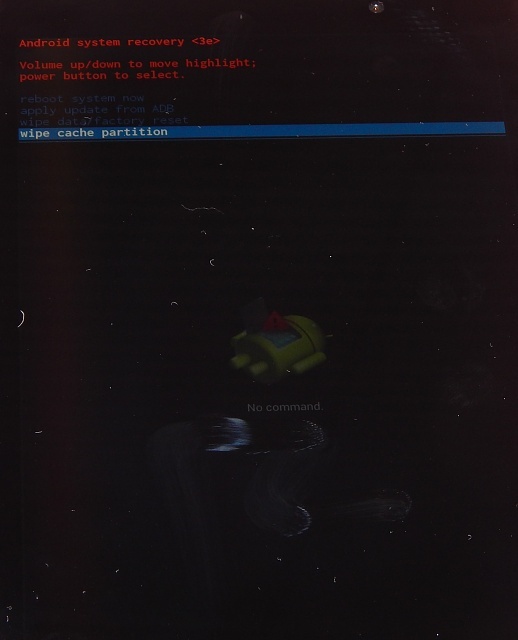 The steps for accessing the Recovery Menu on the 2012 and 2013 Nexus 7 can be found here (https://support.google.com/nexus/answer/2668187?hl=en), but the directions are specifically for a Hard Reset (i.e., a complete device wipe). The following instructions are a slight modification, in order to wipe the cache partition. Apologies for the suboptimal picture quality--you can't take screenshots in the Recovery Menu, and I don't have a professional setup to take photos of a screen! 1. Power the tablet down. 2. Now press and hold Power. As soon as you see the Google logo appear, immediately press and hold Vol Down (while still holding Power). 4. Use the Volume keys to select Recovery (press Vol Down twice), and then press Power. 5. You'll see the Google logo appear for about 5-10 seconds, then our little friend will show up looking a little piqued. 7. Once again, use the Volume buttons to move the cursor up or down. Press Vol Down 3 times to highlight "wipe cache partition," then press Power to execute. 8. You'll see some notifications about the progress at the bottom of the screen--it shouldn't take any longer than 10 seconds or so to complete. 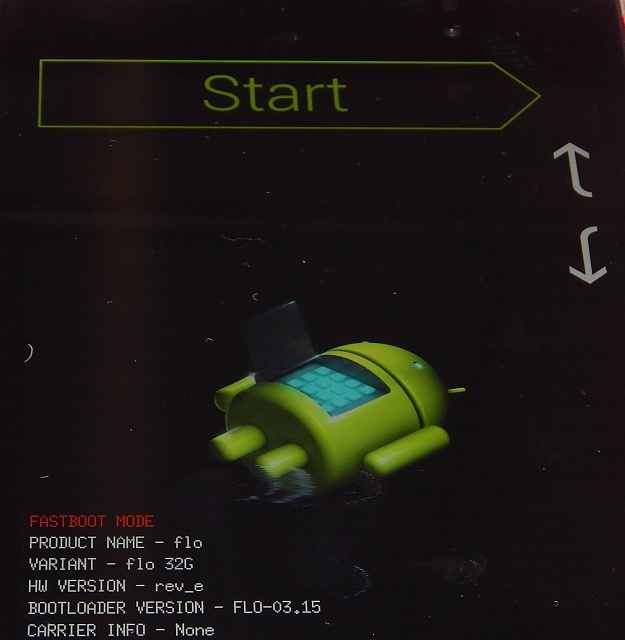 When done, the Recovery Menu will appear again, with "reboot system now" already highlighted. 9. 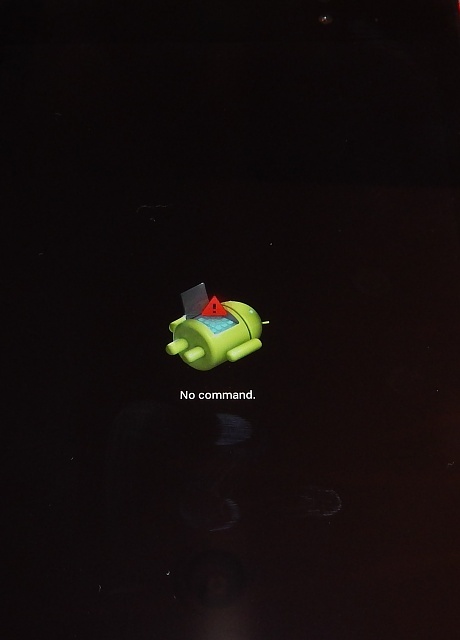 Press the Power button, and your Nexus 7 will reboot, hopefully with a little faster and smoother performance! buster buddy, Ntchwaidumela, Yogi217 and 25 others like this. fs80uk, thenrik and B. Diddy like this. Good to know this will work to achieve a system wipe also. Good job. Thank you. During step 6, my screen went blank and now it does nothing, no power up, no nothing. Nexus 7 is dead. Discovered how to power up. Tried this again. Once again at step 6, holding power and volume up, it goes dead. Got it. At step 6 I was holding the volume up. Should have just clicked it. Thank you. JD Holland and cybernutte like this. Yes, that's the trickiest part. Press and hold Power, then while holding Power, press Volume Up and hold for only about half a second or less. When you release, the menu appears. If you have recently done a hard reset is there any value in wiping the cache partition to solve some problem? I'm not sure, but I would assume that the hard reset would also have wiped the cache partition. Well, if it works for you, then go for it! If I have applied mods using xposed framework, will this affect them? Good question--I don't have the technical expertise to answer it, though. My guess is no, since the cache partition should only contain temporary data. So has anyone had their N7 get really sluggish and slow, done this, did not loose anything and notice an improvement afterwards? 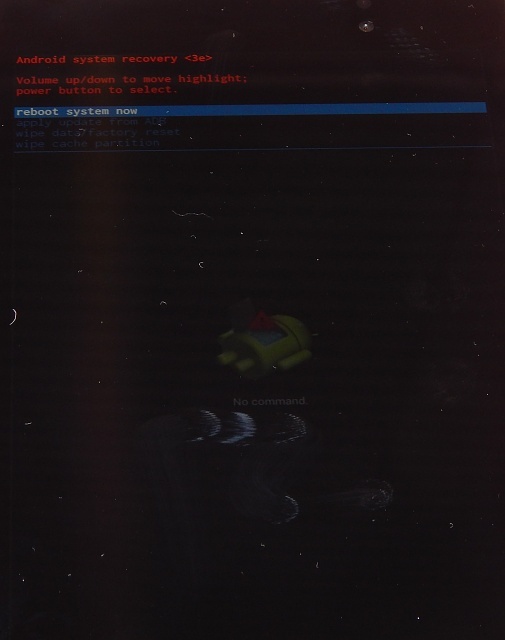 My Nexus 7 has never really bogged down. I've noticed cache partition wipes correct problems on my Razr Maxx, though. I know this op is about wiping the cache, but (IMHO) I've reduced lag and improved performance by flashing Smooth ROM and Motley Kernel (M-Kernel). 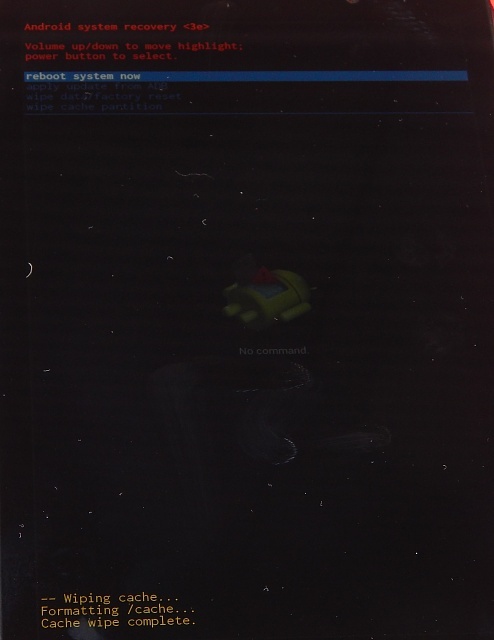 First rom I've ever flashed, and it has made a noticeable difference in the performance of my aging 2012 nexus 7. LeoRex, StLouisMan2 and Spaz888 like this. It should, although the Google support page has a slightly different button-press sequence at the beginning (which I think might also work on the N7). Afterwards, it's the same procedure. Here's the support page--if you're going to follow those steps, just make sure you select wipe cache partition, and NOT wipe data/factory reset. My wife's 7 state to get really laggy, and I tried clearing both the cache and davlik cache... that didn't work. But in the process, I noticed that the system partition itself was nearly full.. I even went as far as a factory reset. But a factory reset leaves the system stuff alone, so I didn't get much relief. Long story short, I unlocked, rooted, and loaded a custom ROM and recovery (i have titanium backup premium, so I saved all her apps and data). TWRP, PA 4 B4, with the pa gapps 'mini'... system partition is now at 200 mb free and the 7 is back to its peppy, responsive self again. StLouisMan2 and jrwatson like this. I'm pretty impressed LeoRex. You certainly know your way around the Tablet. Of course, I am aware that you aren't the only one. What I was wondering was whether you could "fix" an app? I mean, suppose an app that you like developed a bug after a recent update by the developer. Could you isolate it, study it and rewrite the code so that it worked properly again? I'm sorry if I over simplified the task because of my ignorance. But I think you understand the basic question. I'm just wondering whether someone who is very knowledgeable is at the mercy of the app developers like the rest of us. Thanks. My nexus 7 2012 suffered slowdowns after 4.4.2. I found a couple of things. If I filled up my 16G to around the 13G mark - yes I still had 3 gigabytes of room the unit would allow down. When that was cleaned up after a time the slowing down would once again occur. I did the cache reset and it didn't seem to do anything. Finally in frustration I deleted all apps so Google wouldn't start reloading them or cleaned cache and data for all that couldn't be deleted and did a factory reset. I then loaded or enabled or signed into one at a time the various apps, first the obvious Google ones like chrome and Gmail, then in order of importance to me the rest. I've had no issues since. It was a bit of a pain but it did clean the issue up and I also dumped some apps that I want really using. Thanks so much! This was exactly what I needed! I did get the "Launcher has stopped" message after I followed your directions but clicked on the app launcher (circle with 6 squares inside), and now everything's working. Thanks again. Any idea of how to get around this and get to the recovery menu to do the cache partition wipe? Welcome to Android Central! Not sure what to tell you. You're certain you followed the steps exactly? Perhaps there's a physical problem with your unit's buttons. "No personal data will be lost". Does that mean all my apps stay intact with all settings with the cache partition wipe?